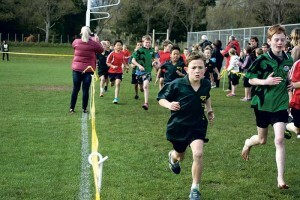 Waitohu School’s Fergus Carpenter set a new record for the year five boys interschool cross country race, completing two circuits of the Haruatai Park’s course in 7 minutes flat, ahead of the second placed runner, Braithan Collins in 7.39 minutes, and James Lei further back in third, a top three placing for Waitohu. 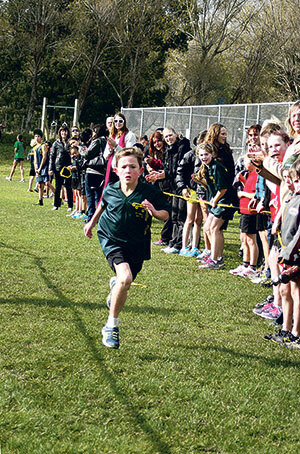 Competitors ran in their year groups for both boys and girls, except for the years seven and eight where they combined the year levels. The top 10 to finish in each race qualified to run at the Kapiti interschool cross country championships the following week. The annual event is run by Peter Ellis from the Kapiti Running and Harrier Club. Students compete from Otaki, Waitohu, Te Horo and Manakau schools and Otaki College.